Our Table Cooperative farms biodynamically (with no artificial chemicals of any sort) on 58 acres of land in Sherwood, Oregon, about 15 miles south of Portland. Our Table’s farm store offers fresh produce from the farm, kombucha on tap, foods made in the farm kitchen, eggs, dairy, meat, grains, coffee and wellness products. Our Table’s menu for its July farm brunch partnering with Oregon Brineworks. Our Table’s farm brunch: a leisurely meal outdoors under umbrellas. Salad served family style: delicately bitter greens, spicy radish & popped quinoa flavored with a light dill pickle vinaigrette & parmesan. Black eyed peas and things with its bright green pea shoots, cherry red tomatoes, neon purple poached egg was a work of art AND delicious. Moist, savory & sweet carrot cake with a remarkable combo of ingredients. 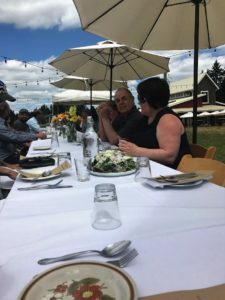 Our Table is a regional cooperative which farms 58 acres in a spectacular location with a view of Mount Hood, about 15 miles south of Portland in Sherwood (Washington County, Oregon) in the Tualatin Valley. All of its plant-based crops, as well as its chickens and eggs are Certified Organic under the USDA’s National Organic Program (NOP). 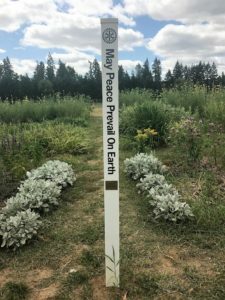 Since 2011, when the co-op took over the property, no artificial chemicals of any sort have been applied and the soil has been restored using Biodynamic practices. Our Table’s farm store sells fresh produce from the farm, foods made in the co-op’s farm kitchen, eggs, dairy, meat, grains, seafood, coffee, health and wellness products and has wine and kombucha on tap. The farm store’s mantra is “Eating local made easy.” And 80% of what is sold is Oregon sourced and 90% certified organic. 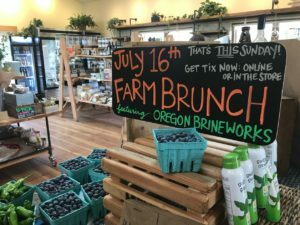 With its farm store and U-Pick blueberries and raspberries, Our Table has made Sherwood, Oregon a destination for folks who appreciate knowing where their food comes from and how it is grown. Moreover, this praiseworthy farm has also created meals and events across the seasons to allow “everyone-chef, farmer, and dinner guest- to form lasting memories at Our Table in the Field,” the co-op’s on-farm dining series. 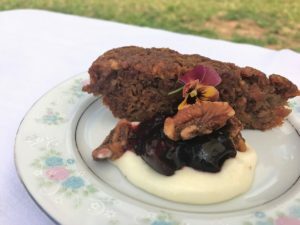 Meals are hosted in various settings across the farm using ingredients that reflect the season and land where the food is crafted. 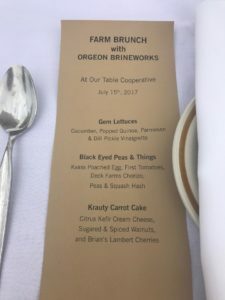 We were particularly fortunate on a summer afternoon to enjoy a leisurely farm brunch which spotlighted Our Table’s brunch partner, Brian Shaw of Oregon Brineworks whose fermented products accented every delicious dish. They even appeared alongside our mimosas; Brian passed us bottles of red and golden beet kvass to sip! 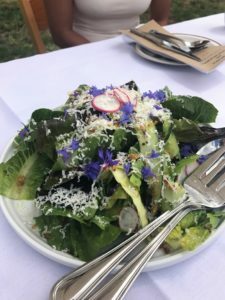 Our first introduction to the Our Table-Brineworks partnership was a tasty salad prepared with fresh gem lettuces, cucumber, radish, and dill from the farm, all dressed in a light dill pickle vinaigrette. Tangy pickle juice complemented perfectly the delicately bitter greens and spicy radish. Popped quinoa and parmesan added lovely texture and deepened the flavor profile. 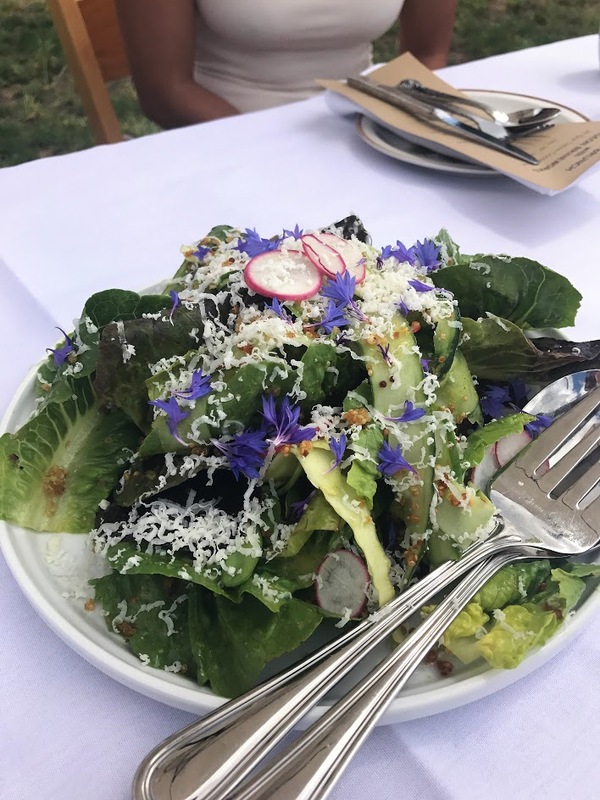 The salad was served family style, and we enjoyed sharing it with a couple locals who joined the brunch on a beautiful summer day. Our next course, black eyed peas and things, showcased puréed black eyed peas serving as a bed for the things— Deck Farms spicy chorizo (the vegetarian version featured mushrooms marinated in fermented hot sauce), a bright purple kvass poached egg, watermelon radish, squash hash, cucumber, pea shoots, and first tomatoes. 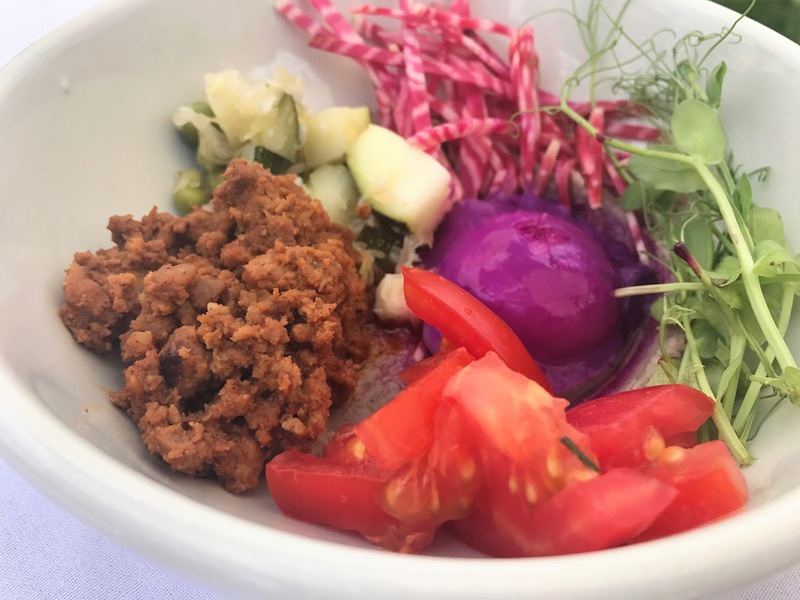 Our Table’s fresh-from-the-field produce rested in perfect proportion to the proteins, creating a light lunch dish that satisfied both the stomach and the eyes. With bright green pea shoots, cherry red tomatoes, and that neon purple poached egg, this dish was a true work of art. Oregon Brineworks made their appearance with the ruby kvass used to poach the egg, as well as the hot sauce used to marinate the mushrooms in the vegetarian version. To complete the experience, we were served krauty carrot cake. This moist pastry truly impressed this savory-inclined reviewer. With just the right amount of sweetness and a rich mouthfeel, the krauty cake satisfied with zero guilt. Citrus kefir cream cheese, sugar and spiced walnuts, and Brian’s lambert cherries rounded out the delicately sweet carrot cake. If they hadn’t told us, I would never have known there was sauerkraut in there! It truly held the magical cinnamon-spice flavor so characteristic of classic carrot cake. Over the course of our afternoon, Brian ate with us and shared stories of his fermenting adventures. We learned that Brineworks relies predominantly on Himalayan pink salt because it has the least impurities of any salt. We also discovered his secret to the perfect beet kvass (more beets!) and listened to the amazing role that microbes play in creating food that nourishes our bodies on the deepest level possible. Jen of Our Table ensured that we had a lovely time with her palpable enthusiasm for the food and farm. 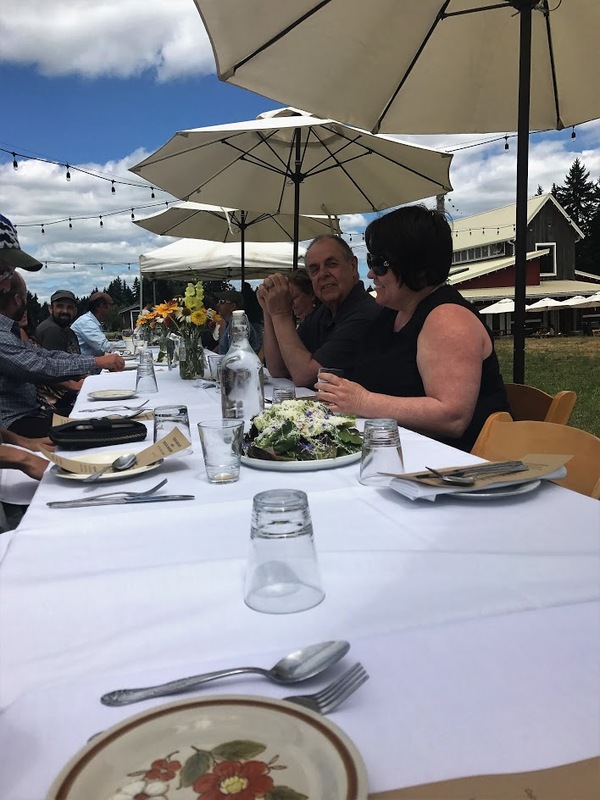 She explained the mission of Our Table’s cooperative business structure where workers, members, and producers all democratically invest in the company, infusing the dining audience with hope for the future of our food systems. As awareness of exploitative and environmentally destructive agricultural practices grows, Our Table’s example of success is an encouraging model.